This guide is to help you look like a Steampunk man and help you understand what is steampunk fashion. This look is based on Victorian-era clothing with dark colors of brown, black and leather. 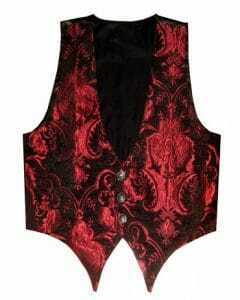 Vests are made from fabrics with paisley patterns with rich gold and brass threading or leather with lots of buttons. Long overcoats and top hats with flashy accessories like a pocket watch, gears, chains and a nice walking cane complete the look. Build or buy a mechanical arm and really turn heads. 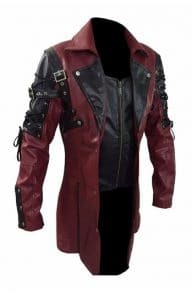 After reading this post you will have a number of mens steampunk costume ideas and know how to dress steampunk. The best part about this style is much of Steampunk clothing can be purchased at thrift stores. A few key items that may be a little more difficult to find would be aviator glasses and top hats. 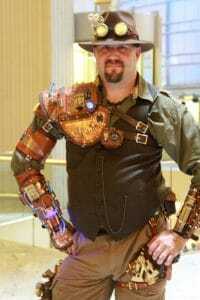 Read on and get some mens steampunk costume ideas. Some of the best accessories are self-made to create a very individual style. This Steampunk for beginners guide is to help you understand the look and get ideas on how you can personalize your look. With a few key accessories that will be sure to give you that Steampunk look. There are rules but rules are meant to be broken. So don't fret to much and let your imagination run wild. This is the beauty of steampunk individualism, creativity and ingenuity are the most important things. If you are not into searching for thrift store items to get your Steampunk look together than this guide is for you. For do it yourselves I will give you ideas on how to look Steampunk. 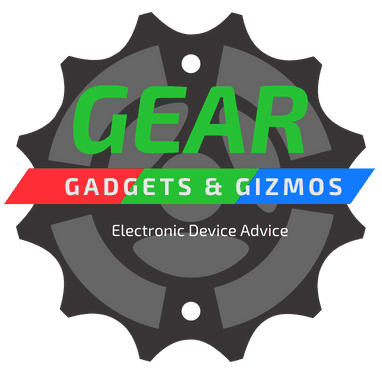 For the quick and dirty we will provide links to purchase your Steampunk gear. Steampunk is a Victorian-era industrial fashion that has been lifted from the pages of science fiction books about a society run by steam. Start with Victorian era style clothing and add from there. This era was the first to take advantage of steam power. During the latter part of the 19th-century was a very industrial era with many new inventions and technologies. Steam power was a major game changer and was affecting and changing everyday life. Steam was also expected to develop into a major power source but some how the petroleum industry took over and steam became a sideline. This is why the premise of this genre is placed in this time period. Accessorize. Create an outfit that delights the senses. 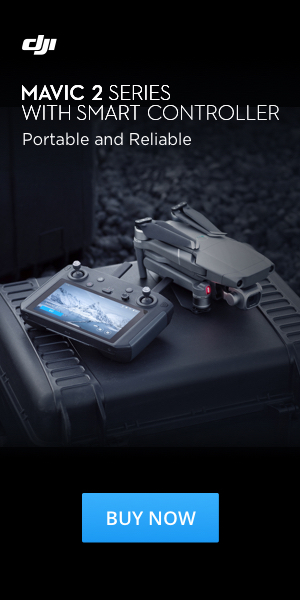 Although there are rules, this genre can be a mixture of gear, gadgets, and gizmos to create your own unique style. Accessories are what makes this style pop. There is no Steampunk color. In my research, many Steampunk aficionados say that Steampunk colors are brown, black and white, correct to the Victorian time period. But Steampunk is fantasy writing, a world of comparatively advanced technology that is capable of creating vibrant colors and complicated man-made patterns. This can make the justification for any color. You can mix other genres with Steampunk. This is in keeping with the Steampunk philosophy. Use what you have, be creative and foster individual diversity. There are no real rules. You will meet people that are more opinionated on this issue than other. But the Steampunk community despite its rebellious nature seems to attract wonderful friendly people. The only rule that is important is to have fun and break free from your everyday life. Before you get started it’s a good idea to pick a character from the Steampunk genre, as it will guide you in your decision-making. It will help you decide on what type of clothing to purchase and what kind of accessories you will need to get the look you're after. Here are a few examples of character ideas to choose from but I am sure if you read a few books or watch a few Steampunk movies there are a number of other characters to choose from and being a free-spirited sub-genre culture you can invent your own character. This is by far one of the favorite accessories in getting that Steampunk look. 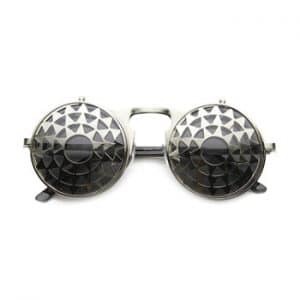 There are a few styles of Steampunk glasses to choose from. They usually are Aviator goggles adorned with intricate brass artwork, welder’s goggles, or sunglasses with round lenses. Referencing to what was available in the Victorian time period. The real creative types add machinery to their glasses. You can buy elaborate pre made glasses or you can purchase a basic pair of welding googles. 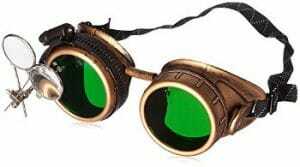 Paint them with copper paint, add some gears, gizmos and you will have a one of a kind pair of Steampunk glasses. If you had money to buy only two things to get the Steampunk look. It would be a top hat and goggles. 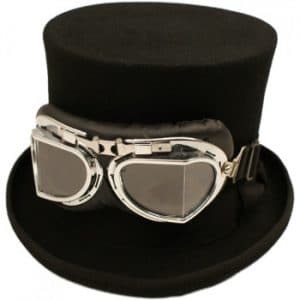 Put on some older style clothing add a top hat and goggles and you’re a starter Steampunk. Many hats are made from leather and adorned with gears, clocks, feathers, laces and many other variations. Highly creative artist make custom one of a kind hats. If you are really into Steampunk you can learn how to make one on your own. There are a number of books and videos instructions available. If you attend any Steampunk Festival there are many creative people there willing to share their knowledge. 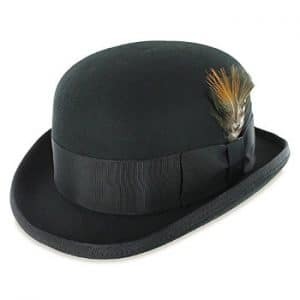 Bowler hats also works well with Steampunk. This is the fun part if you are into thrift store shopping. You are looking for older style clothing as was worn during the Victorian era. Staying with dark colors as per the time period. Be careful in choosing items that may look Steampunk but looks more like a 70s hippie. Look for fabrics from this time period like wool and cotton, plaids and tweeds, polyester is a big no-no. The follow fabrics were available during the 19th Century. This is what you should be looking for. Denim You may say, hey denim was available during the 19th Century and with that, you would be right. But denim then unlike now was strictly considered work clothes. Men of the time only wore jeans to do work any formal function jeans were not worn. Knits I found this listed in my research with no explanation as to why. Knitting was available at the time but I guest by using knitted items would give the look more of a Steamgrandma than a Steampunk look. Synthetics Polyester and synthetic were not to come for a number of years. The list of fabrics and textiles that are favoured is based on what was available during the industrial era. Important to some purists of Steampunk that want to stay accurate to the time period but as Steampunk is an imaginative genre you can make whatever fabric you like work. Men’s clothing during this period as is today has less variety than women. Colors tended to be basic brown, black and gray. But some well to do men wore rich dark textile colors vests and cravats as a show of their wealth. Choose shirts with an old style collars long sleeve with buttons up the front. Keep in mind that Steampunk men are mostly dressed in formal attire old-style tuxedo shirts could work nicely. Shirts are normal white with a variation on the collar. High collars and different sized collars were in style during this time. 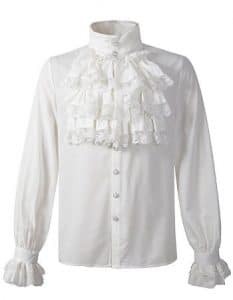 Do you remember the Seinfeld episode where Jerry is wearing a puffy shirt? If he would add a top hat and goggles and a few accessories he would be Steampunk. I have included a long sleeve t-shirt from Amazon for an instant Steampunk look. 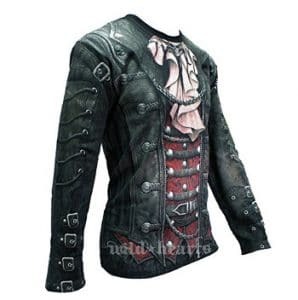 Hint: If you are having trouble finding a shirt go over to the women's section and often there will be items that will work for your steampunk look. In choosing a proper pair of pants to fit the Steampunk style. Stay away from modern pleated pants. Pleated pants were not in fashion during the Victorian era and many people think they should never be in fashion. Stay with browns and black colours. Tweed, corduroy and wool fabrics also work well. But be sure they have no pleats and more of a tapered leg. You will probably find a number of wide leg corduroys pants with no pleats. I had a few pair in the 70s. These pants will make you look more like a hippie then Steampunk. 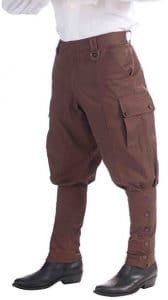 If you want to kick it up a notch find some old Airship Pants if you cant find them used see Amazons Victorian Airship Pants to get a pair. Another thing to look for is button pants with buttons on the front and no zipper just like the time period. A Steampunk vest is a very important accessory. Keeping with what was available during the Victorian era. A vest can be made from leather or most popular is elaborate rich textiles, paisley patterns, strips, canvas or corduroy. Button up style with either a round or notched lapel. Dark colors are more common, but for contrast light colors like ivory or silver make for a real classy formal look. Leather can create a more rugged apocalyptic look and less formal. 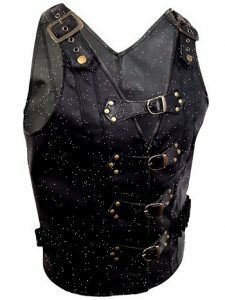 Adding buckles, buttons, straps, and chains all add to the individual look of a Steampunk vest. 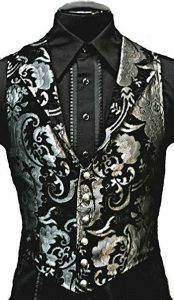 Hint: If you are having trouble finding a vest go over to the women's section and often there will be items that will work for your steampunk look. 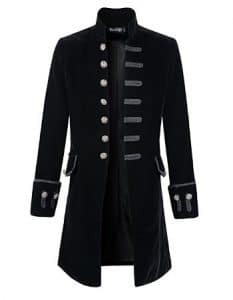 Stick with a Victorian style coat or topcoat/ tailcoat as they were referred to in the day. What you are looking for is a longer style jacket that flares out at the bottom made from tweed, wool, velour or leather in a darker color. Old style military jacks work well found at many thrift stores but increasingly harder to find. If it has a zipper keep looking. Buttons, straps, gear, gadgets, and gizmos add additional adornment from this time period to give it that authentic Steampunk look. Be careful when choosing your jacket paying attention to the buttons and modern patterns. You could end up looking more like Jimmy Hendricks in the 60s then a Steampunk. But that Ok I always-loved Jimmy’s look. Another thing to consider when choosing a topcoat is how warm is it and what time of year is the Steampunk Convention you are interested in attending. Many are held outdoors in the summer. The idea of wearing a long sleeve shirt and vest with a wool topcoat at a warm outside Steampunk Fair in July could be a little warm for some people. 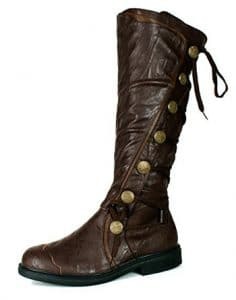 From my research, the number one thing about Steampunk boots is that they are made from leather. Number two and three is laces and buckles. Referring back to the time period when leather boots and shoes were the only options and the zipper had not been invented yet. Brown and Black are the main colors to choose from. High boots are common but mid-height boots will also work well. 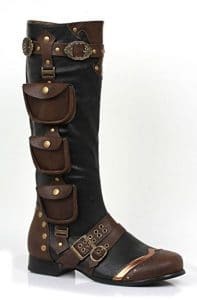 Steampunk boots are something I think is worth purchasing if you love your boots and plan to participant in more Steampunk gatherings. 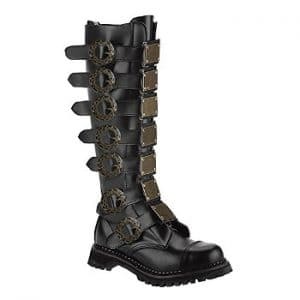 A number of shoe manufacturers have started making a number of really cool Steampunk influenced boots that come with a number of embellishments like buckles; chains and additional storage pouches. In a pinch, a pair of dark brown leather work boots with laces will get you to the fair on time. Ideally they should have a little wear to them so you don't look like a total newbie. Just a plain pair of leather shoes will also work just leave the sneakers at home. The previous steps to looking like a Steampunk man is the basic foundation of this look. But the most important part of Steampunk fashion is the gear gadgets and gizmos that are added to the look to create a totally unique one of a kind look. 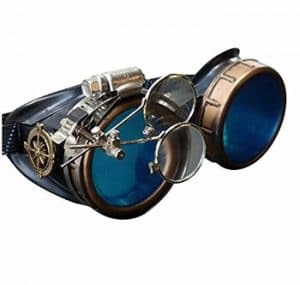 This is what I think attracts most people to this genre, the more creative the better, from adding simple pocket watch with a long chain, top hat, and goggles. To Sophisticated mechanical headgear or arm made of brass and gears. Many add backpacks with self-made weapons. Many creative types mount elaborate self-made apparatuses to their back some with canvas wings as in the style of the great flying machines. Accessories can be purchased on online or at a number of Steampunk conventions. Pinterest and Etsy is a good source for one of kind Steampunk mechanical device accessories. Individually sold by talented artists. Here are some accessories ideas on what is available. But much of the best stuff is self-made. The pocket watch is another very important accessories in the Steampunk genre right behind the top hat and goggles. The wristwatches were not available during the Victorian era. Any self-respecting man of the era had a pocket watch and men of status had elaborately embellished watches on the end of a gold or silver chain. You can wear your watch in the traditional way, in the front lapel pocket with a chain draping down. Or you can go more Clockwork Orange and mount a pocket watch to your top hat with a few gears and maybe a feather. Here are a few inexpensive watches from Amazon. 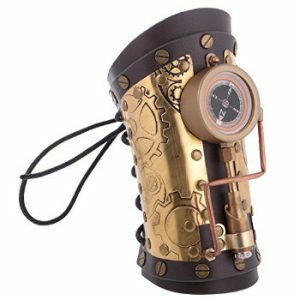 The mechanical arm is the ultimate Steampunk accessory. 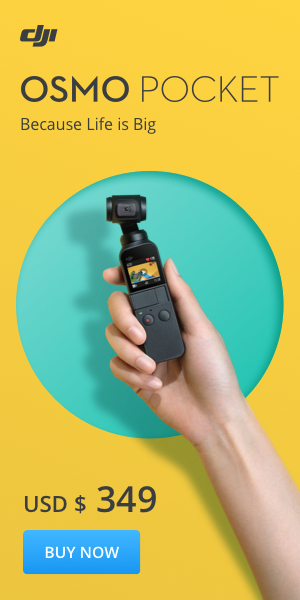 If you’re a gear gadget and gizmos kind of guy than the attraction of having a mechanical arm is unmistakable. With the apocalyptic nature of this fictional genre, the mechanical arm represents man and machine. Man since the industrial revolution theorized the replacement of human parts with machines. The bulky impractical arm with a built-in machine gun is what makes this genre so fun. 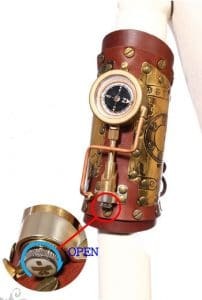 There are a number of artists making one of a kind Steampunk arms that can be purchased on Etsy. But they’re not cheap. There are also a number of videos and websites that show you how to make a mechanical arm. Using a number of readily available materials that can be purchased at your local hardware and craft supply store. Ingenuity, creativity, and self-reliance are what fuel this culture. Here are two that are sold on Amazon that may interest you. The one in the middle is a example of what you can do with a little wood, brass, rivets and gears. 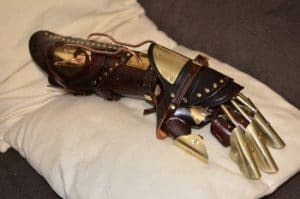 Great example of an over the top DIY arm made with brass and wood. Steampunk Accessories are really what can create a real individual look. Many objects have a meaning and most serve some kind of function or purpose. The character you choose will help dictate the accessories you will require. Part of getting involved in the Steampunk community is with Steampunk you can never have enough accessories. Accessories can be found anywhere. A favorite Steampunk store is Home Depot. Particularly the copper pipes and brass fittings section. 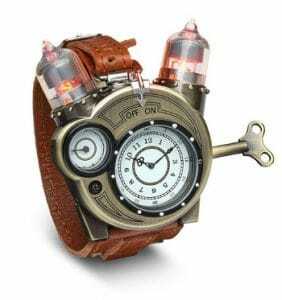 At their conventions, there are many Steampunk products that are on sale and you will always be tempted to buy another gear, gadget or gizmo to add to your collection. During these gatherings, they have a number workshops. You can learn among other things how to make a number of Steampunk props and gadgets. You can leave the convention with something new you created along with special memories at no extra charge. On top of that leave you very inspired to try to create something new on your own. Below are a few ideas to get you started. Many a very inexpensive bling that can add something extra to your character, but if you plan to participle in Steampunk more in the future. I think you will find some really cool creative stuff and a lot of interesting people when you get out there. Now that we have gone over how to be a Steampunk man, you can see there is a lot of room for creativity. Some people try to be period accurate by sticking to what was available during the latter part of the 19th century and others are a bit more flexible.But because of its fictional nature, many-advanced machinery and gadgets can be justified. The main part of Steampunk is the people you will meet. Creative people that want to step out of the normal everyday life and have a little fun. Being Steampunk takes a little time to get all your gear together and I believe that is the fun of it. This guide and links can help you get an outfit together fast for a costume party or Halloween. 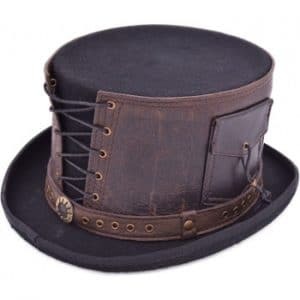 But for the real Steampunk that would like to take part in festivals and more than purchasing a few things to get started and learn more about what your alter ego needs. Stick with these basic clothing options and you should be on your way to being a Steampunk. Learn more with our post What is Steampunk All About?